They’ve reissued all their studio albums and put out both a greatest-hits and outtakes/B-sides anthology. Much like their fellow Twin/Tone vets the Replacements, though, the one thing the Jayhawks have never properly done is issued a live record. That void may or may not be filled finally with the release of “Live at the Belly-Up,” a digital-only album from the Minneapolis alt-twang/folk-rock group due for release April 7 via via iTunes, Amazon, Spotify, etc. The recording was made back in January during the band’s latest tour behind reissues of their 1997-2003 albums. The 20-song, 80-minute set was captured at the Belly-Up Tavern near San Diego. 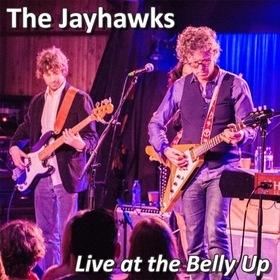 With the Jayhawks' permission, the club’s staff recorded the show as part of a series of recordings issued via their website, where it’s been quietly available since mid-February. It proved to be enough of a hot seller and high-quality recording that the group opted to bring it to a wider release. “It’s a real crime, considering their reputation as a first-class live band,” Jayhawks archivist/wrangler PD Larson said of the lack of a proper live record. Their 2002 acoustic collections “Live at the Women’s Club, Vols. 1 & 2” are the only thing that came close -- issued on a small scale with raw (but charming) quality. Larson said there are some but not many other high-quality live recordings from past Jayhawks eras that could be fodder for release. Among them: A collection done with a full-blown mobile recording truck at First Avenue in December 2003, during what were unspokenly intended as the band’s farewell shows. But trying to release any of these past recordings would be tricky on several business fronts. Things went so well for this lineup of the band over the past year, there's talk of a new studio album also being in the works. But let's stick with this for now. Here’s a little promo video from the Belly-Up’s site for the live set.